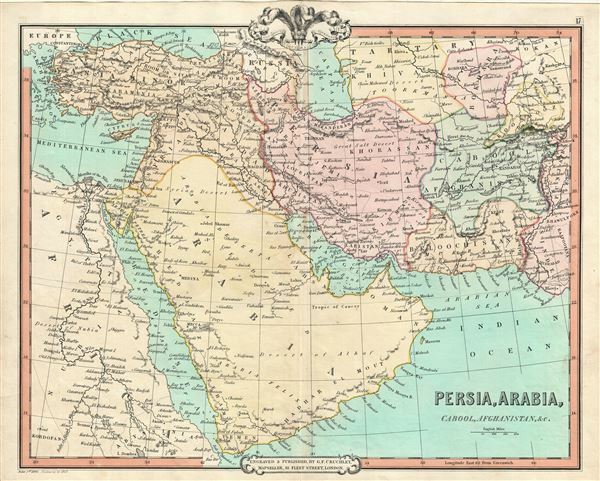 A fine example of the 1850 map of Persia, Arabia and Afghanistan by G. F. Cruchley. Centered on the Persian Gulf, this map covers from the Mediterranean and Red Sea eastward as far as India, including all of modern day Turkey, Saudi Arabia, Israel, Jordan, Syria, Iran, Iraq, Kuwait, Afghanistan, and parts of Pakistan. Part of Egypt and eastern Africa are also included, depicting the region dominated by the Ottoman hegemony.